Yuchi (Euchee) is the language of the Tsoyaha (Children of the Sun), or Yuchi people living in Oklahoma. Historically, they lived in the southeastern United States, including eastern Tennessee, western Carolinas, northern Georgia, and Alabama, in the period of early European colonization. Many speakers of the Yuchi language were forcibly relocated to Indian Territory in the early 19th century. Some audio tapes exist in the collections of the Columbus State University Archives in Columbus, Georgia. Yuchi is classified as a language isolate, because it is not known to be related to any other language. Various linguists have made claims, however, that the language has a distant relationship with the Siouan family: Sapir in 1921 and 1929, Haas in 1951 and 1964, Elmendorf in 1964, Rudus in 1974, and Crawford in 1979. In 1997, the Euchees United Cultural Historical Educational Efforts (EUCHEE) claimed that there were currently two spoken dialects: the Duck Creek/Polecat and the Bigpond variations. Yuchi is primarily spoken in the northeastern Oklahoma, where Yuchi people live in Tulsa, Okmulgee, and Creek counties, within the Muscogee (Creek) Nation's tribal jurisdictional area. In 1997, 12 to 19 elders spoke the language out of an estimated Yuchi population of 1,500 speakers. In 2009, only five fluent speakers whose first language was not English remained. Yuchi people lived in Tennessee at the time of European and African contact. In the early 18th century, they moved to northwestern Georgia in the southeastern United States. In the 1830s, speakers of the Yuchi language were forcibly relocated with the Muscogee people to Indian Territory prior to the Trail of Tears. The spoken Yuchi language has changed over time, in part due to relocation. In 1885 in an article in Science, Swiss linguist Albert S. Gatschet wrote about various linguistic idiosyncrasies in Yuchi. He claimed that adjectives are not expressed with number, but nouns are with the addition of the particle ha (coming from the original term wahále, meaning many) which made the word essentially plural. He also claimed that the language was no longer in an archaic state due to the lack of a "dual," and that the language had temporal and personal inflection. Gatschet also did lots of field study and documentation regarding the language, many of his original vocabulary lists can be found at the National Anthropological Archives or on their website. In 1907, Frank G. Speck published Ethnology of Yuchi Indians, which claimed that Yuchi only had one dialect, that inflection was not a characteristic, and that there was no true plurals. This information contradicts the study made by Albert S. Gatschet in the century beforehand. The two authors agreed on linguistic idiosyncrasy, the case of the third person. In 1997, the Euchees United Cultural Historical Educational Efforts (E.U.C.H.E.E.) published a work entitled Euchees: Past and Present, which provided more recent information regarding the language. The organization states two dialects exist today, from the Duckcreek/Polecat and Bigpond areas. This contradicts Speck's 1907 claim of only one dialect. 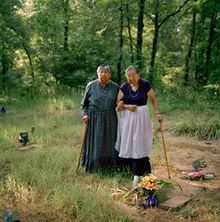 Sisters Maxine Wildcat Barnett (left) and Josephine Wildcat Bigler (1921–2016); two Yuchi speakers, visiting their grandmother's grave in a cemetery behind Pickett Chapel in Sapulpa, Oklahoma. According to the sisters, their grandmother had insisted that Yuchi be their native language. Due to assimilation into Muscogee and English-speaking culture, only a few elderly speakers of the Yuchi language remain. In 2000 the estimated number of fluent Yuchi speakers was 15, but this number dwindled to 7 by 2006 5 by 2010, and 4 by 2013. In 2016, first-language speaker and Yuchi elder Josephine Wildcat Bigler died. She had been active in recording and preserving the Yuchi language for future generations. The Euchee Language Project teaches Yuchi classes in Sapulpa, Oklahoma, free of charge. The Yuchi people and language are the subject of a chapter in Spoken Here: Travels Among Threatened Languages, a book on endangered languages by Mark Abley. The language originally had no written standard until the 1970s, when James Crawford and Addie George created a phonetic transliteration which is now used by the Yuchi people to write the language. Yuchi is an agglutinative language, in which words are pieced together out of pre-existing morphemes to make new words entirely. The word order of the language is subject–object–verb. The language has 49 sounds, 38 of which are consonants, and the remaining 11 are vowels. This number is more than twice the number of most Southeastern Native American Languages. Yuchi has oral and nasal vowels. Oral vowels are defined as being created by the raising of the soft palate to the nasopharyngeal wall, creating a velopharyngeal space within the oral cavity; nasal vowels, on the other hand, are typically defined as being created by the lowering of the soft palate, allowing air to escape through the nasal cavity. The phonemic vowels of Yuchi are /i, u, e, o, æ, a, ĩ, ẽ, õ, æ̃, ã/; some levels of phonological or morphological variation must therefore be occurring in order for all of the sounds above to be possible. Phonological variation often occurs in different kinds of morphological environments. For example, the phoneme /o/ is often pronounced as /ʊ/ in 1st-person singular and impersonal 3rd-person pronouns by Big Pond speakers. Also, the phonemes /a/ and /o/ can become [ə] in unstressed environments. Vowel length indicates grammatical function, such as superlative or comparative adjective forms or emphasis. It may also indicate contracted morphemes, and thus is not a phonological process but rather a morphological one. [ˈɡopʼa] – "Creek person, tribe" [ɡoˈpʼa] – "go see someone" [ˈsɛt ˀne] – he sees [sɛt ˈˀne] – she sees [ʃaˈja] – "weeds" [ˈʃaja] – "squirrel"
As mentioned above, most nouns have syllable-final primary stress[again, by syllable does this mean word or morphological unit? ]; there are, however, some regularized exceptions to this rule, the most common of which are nouns with lexicalized suffixes in the stem, which have stress on the penultimate syllable. Also, contractions within compounded nouns have primary stress on the contraction. There are various other exceptions, but the two mentioned above are the most frequent and the most important in helping us to understand why Yuchi nouns often appear to have irregular stress patterns. Both regular and non-regular stress patterns are exemplified below, all glossed. All data come from Wagner, 1974, unless otherwise noted. One of the most significant aspects of Yuchi morphophonology is the prevalence of contractions. Contraction should not here be taken to mean only a shortening of words; rather, it is more useful to think of contraction as a deletion of sounds that in turn affects surrounding vowels. What can be contracted is dependent upon two major factors, the sound which begins the contracted syllable, and the stress of the syllable. In order for a syllable to be contracted, it must begin with a [+sonorant] consonant, that is, a voiced sound with a relatively free passage of air. In Yuchi, this includes sounds such as /n/, /ˀn/, /w/, /ˀw/, /j/, /ˀj/ (where /ˀ/ indicates a glottallized sound),[why are these not listed among the consonants?] the fricative /ˀh/,[clarification needed] and /Ɂ/. A syllable must also be unstressed in order to contract. Contraction causes phonetic changes in the vowels directly preceding the deleted syllable. In order for Yuchi speakers to understand the grammatical features of the words being used in contracted forms, vowel features alternate to match the deleted sounds. So, for example, if the morpheme /ne/ was contracted, the vowel preceding it would become nasalized to indicate that a nasal sound has been lost. /nɛ/ can contract here because it is an unstressed syllable beginning with a sonorant: [di ˀlɛ mp ʔá jɛ]. CCC clusters are relatively rare, occurring in only six variations as noted by Wolff, four of them beginning with fricatives; such a construction as above would therefore likely be odd to speakers of Yuchi. Contractions take on several forms and occur in many other environments. Those seeking additional information about the many kinds of contraction in Yuchi are advised to seek out Dr. Mary Linn's "A Grammar of Euchee." A list of the most commonly contracted morphemes is below, along with their grammatical function. Like many indigenous American languages, Yuchi grammar is agglutinative. Words are formed by the addition of various prefixes and suffixes to a mono- or polysyllabic stem. Yuchi features separate male and female registers and an idiosyncratic noun classification system wherein nominal distinction is made regarding animacy, Yuchi ethnicity, kinship and, for inanimate nouns, shape or spatial position. Much of the information in this section is drawn from Wagner (1938); some of Wagner's conclusions, particularly regarding his interpretation of Yuchi kinship terminology and certain aspects of his description of Yuchi pronouns, have been disputed. The Yuchi verb consists of a mono- or polysyllabic stem modified almost exclusively by suffixing. Yuchi features attributive verbs, which is to say that the language makes very little distinction between verbs and adjectives as parts of speech. For this reason, Yuchi verbs and adjectives are virtually identical. The concept of temporal verb inflection is only weakly realized in Yuchi and corresponds more closely in some cases to aspect rather than tense. The past tense is generally expressed via suffixing of the verb stem. There are also two ways of expressing future tense. The first, which usually denotes intentions or events of the immediate future, is expressed by lengthening, stressing and nasalizing the final syllable of the verb stem. The second, pertaining to the distant future, is expressed by the suffix -e'le. Modality of the verb is also expressed through suffixing. Nouns are classified according to a broad animate versus inanimate paradigm which is expressed using a variety of article suffixes. Within the animate class, nouns are further subdivided into two sub-classes. The first of these includes all humans belonging to the Yuchi tribe, and is itself further divided according to a very complex system of kinship relations and gendered speech registers. The second sub-class of animate nouns encompasses all human beings outside of the Yuchi tribe, as well as animals, and the sun and moon. The animate (Yuchi) suffixes express a very complex system of kinship and gendered speech in much the same way as do third person pronouns. Inanimate nouns are divided into three groups: objects that are vertical, objects that are horizontal and objects that are round or otherwise do not conform to either of the other two groups. Each of these groups is represented by a suffix. The concept of plurality in Yuchi is not as strongly developed as in English, leading one early descriptivist to claim that Yuchi has "no true plural." Animate nouns can, however, be pluralized by the addition of suffixes that correspond closely to their singular counterparts. Although tribal affiliation and gender distinctions carry over into the plural, kinship does not. Inanimate nouns can be made plural by the suffix -ha, which replaces the singular inanimate suffixes listed above. In addition to suffixing, several words related to kinship are pluralized via reduplication of the stem. The Yuchi pronoun is extremely complex. Except in a few emphatic forms, the pronoun is always suffixed to a verb or noun stem, and appears in eight distinct sets. The first pronoun set, termed the Subjective Series, denotes the subject relationship of the pronoun to the verb. Series 1 and 2 are close variations that respectively represent a general and specific object, whereas the "independent series" represents freestanding pronouns. Third person pronouns follow a complex pattern of kinship and gendered speech that corresponds very closely to the animate noun suffixes. First person pronouns in the plural are inclusive and exclusive, and there are several kinship-specific third person forms. A few of the third person singular pronouns double as plural pronouns as well. The next set, termed the Objective Series, denotes the direct or indirect object relationship of the pronoun to the verb. It otherwise functions identically to the Subjective Series; the two pronoun sets are distinguished by their relative positions within the verb complex. The third person singular pronouns are identical to those of the Subjective Series. As above, the third person plural pronouns are identical to those of the Subjective Series. Reflexive pronouns are amalgamations of the Objective Series 1 and Subjective Series 1 ("Reflexive Series 1") or Subjective Series 2 ("Reflexive Series 2") pronouns. Reflexive third person pronouns function the same, in terms of kinship and gendered speech, as their non-reflexive counterparts. Plural reflexive pronouns demonstrate clusivity in the first person, and are identical to non-reflexives in terms of kinship and gendered speech. Plural reflexive pronouns function identically to their non-reflexive counterparts in the third person. The relationship between an action and the instrument by which it is carried out is expressed via the prefix hi-. This prefix has become fused in some cases with certain verb stems, forming a sort of instrumental verbal compound of idiomatic meaning. The concept of location is important to the Yuchi verb complex. Similar in some ways to the English preposition, these prefixes denote the location or direction of the verb's action. Additionally, there are four very general locative suffixes that can be used in place of the prefixes listed above. In direct speech wherein the sentence does not begin with an interrogative pronoun, interrogatives are formed with the suffix -le. If the question implies some action in the future, the suffix -yi is used instead. ^ Hammarström, Harald; Forkel, Robert; Haspelmath, Martin, eds. (2017). "Yuchi". Glottolog 3.0. Jena, Germany: Max Planck Institute for the Science of Human History. ^ "Joseph Mahan Collection(MC 32)". archives.columbusstate.edu. Retrieved 2017-08-23. ^ Mithun, Marianne. The Languages of Native North America. Cambridge: Cambridge University Press, 2001. ^ a b Euchees: Past and Present. Sapulpa, OK: E.U.C.H.E.E., 1997. Print. ^ Jackson, Jason Baird (2004). "Yuchi". In Fogelson, Raymond D. Handbook of North American Indians: Vol. 14, Southeast. Washington DC: Smithsonian Institution. p. 415. ISBN 0-16-072300-0. ^ Gatschet, Albert S. "The Yuchi Tribe and its Language." Science 5.112 (1885): 253. Print. ^ Speck, Frank G. Ethnology of Yuchi Indians. Philadelphia: University Museum – UPenn, 1909. Print. ^ a b "Our partners and advisors: The Euchee Language Project". Cultural Survival. Archived from the original on 8 April 2016. ^ "One of the Last Remaining Native Yuchi Speakers Passes". Cultural Survival. 14 June 2016. Retrieved 17 June 2016. ^ Mark Abley (2005). "4. Unseen And Unheard: Yuchi". Spoken Here: Travels Among Threatened Languages. Houghton Mifflin Harcourt. pp. 53–82. ISBN 0-618-56583-3. ^ "Euchee Language Project." EucheeLP.org. Euchee Language Project. Web. 12 Sept. 2009. ^ Wolff, Hans. "Yuchi Phonemes and Morphemes, with Special Reference to Person Markers." International Journal of American Linguistics. 14.4 (1948): 240-43. JSTOR. Library of Congress. Web. 12 September 2009. ^ Edmondson, Jerold. "Yuchi." Arlington, Texas: University of Texas at Arlington, 2011. Sound recording. ^ a b Gatschet 1885, p. 253. ^ Wagner, Günter (1938). "Yuchi". In Boas, Franz. Handbook of American Indian Languages – Part 3. Columbia University Press. pp. 300–84. ^ Speck, Frank G. "Eggan's Yuchi Kinship Interpretations." American Anthropologist 41.1 (1939): 171. ^ Ballard, William L. "More on Yuchi Pronouns." International Journal of American Linguistics 44.2 (1978): 103-112. ^ Wagner 1938, p. 312. ^ Wagner 1938, p. 343. ^ Wagner 1938, p. 351-2. ^ Wagner 1938, p. 352. ^ Wagner 1938, p. 354. ^ Wagner 1938, p. 320. ^ a b Wagner 1938, p. 321. ^ Wagner 1938, p. 326. ^ Wagner 1938, p. 310. ^ Wagner 1938, p. 322. ^ a b Wagner 1938, p. 323. ^ Wagner 1938, p. 311. ^ Speck 1909, p. 15. ^ a b Wagner 1938, p. 324. ^ a b Wagner 1938, p. 325. ^ Ballard 1978, p. 103. ^ a b Wagner 1938, p. 330. ^ Ballard 1978, p. 104. ^ Wagner 1938, p. 333. ^ a b Wagner 1938, p. 358. ^ Wagner 1938, p. 361. ^ Wagner 1938, p. 357. Gunther Wagner (1931). Yuchi Tales. Internet Archive. Retrieved 2012-07-07. Gunther Wagner (1938). "Yuchi grammar". Handbook of American Indian Languages. pp. 300–374. Retrieved 2012-07-07. "Yuchi Language Project Attends Youth Language Fair". Cultural Survival. 2012-04-26. Retrieved 2012-08-08. This page was last edited on 29 March 2019, at 17:51 (UTC).